Supporting Objects comprises several series of re-worked objects, images of the human body and elements of the built environment, namely pillars, arches, doorways and bridges. At the heart of the exhibition is a new installation made up of several tables, each holding on its tabletop a discrete constellation of objects and materials arranged in precariously balanced situations, teetering between stability and collapse whilst spatially “extending” the tables across the space. This site-responsive installation for the upper floor of the gallery connects its three rooms via a series of linking gestures that draw lines of movement, indicate trajectories and journeys through spaces, and at the same time separate and divide them. 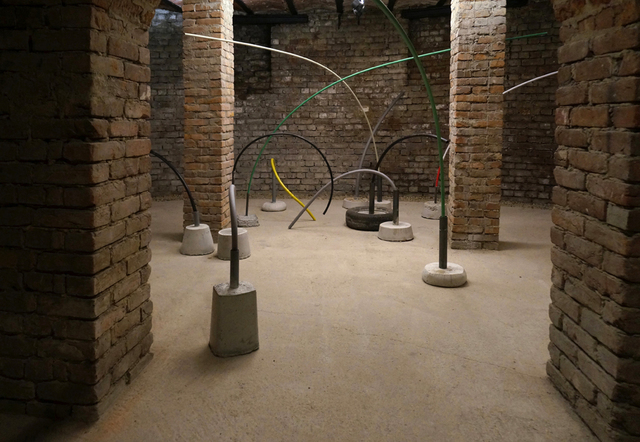 In the labyrinthine chambers of the gallery’s basement, Horvat constructs several makeshift clusters of sculptural works, referencing arches and pillars; the dominant architectural elements found in the basement. These new works made on site mirror – albeit imperfectly – particular features of the space they occupy, and they do so with an element of both failure and playful mischief. Broadly speaking, all the works in the exhibition revolve around questions of balance and stability, challenging the idea of solidity and permanence of various structures, particularly structures which in their regular spatial economies serve some kind of a supporting function – to prop things up, to hold up other structures or objects, to stabilise and hold things in place. 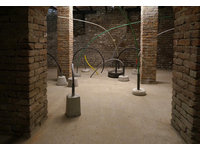 The artist approaches these structural supports as something temporary, provisional and precarious, constructing them – as she frequently does in her work – using commonplace building materials such as sticks, cables, hoses, pipes and metal rods, which are combined here with concrete forms and pieces of modified, previously functional objects.